Hollywood Superheroes & Angry Characters interact with Street Artist Mike McNeilly and the Mystery Girl, Bubblehead. ...sweep up the streets of Hollywood, filling orange bags with radioactive star stuff. 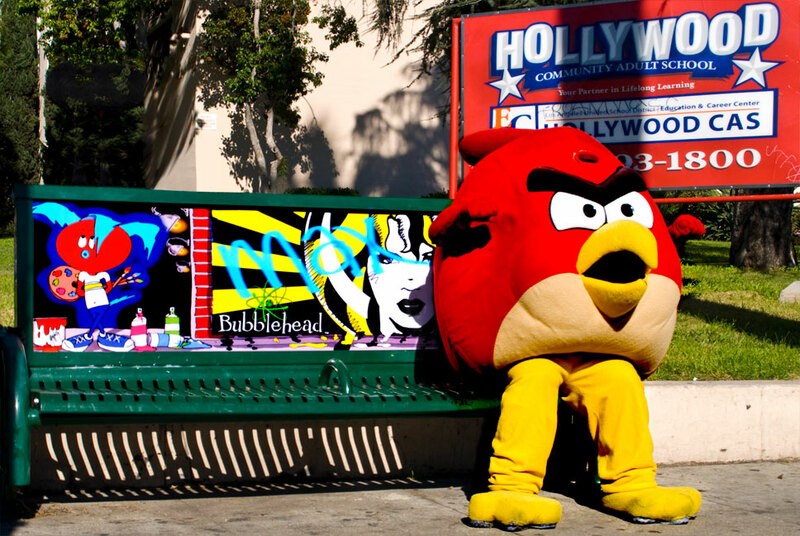 An angry now bird sits outside of Hollywood High School waiting to take the MTA bus and giving the individual gas guzzling car drivers an evil eye. "RadioActive Bubblehead" just painted at Hollywood & Vine is overlooking the historic Pantages Theatre, the "W" Hotel and the Hollywood Walk of Fame. A local cleaner works to sweep up the streets of Hollywood, filling orange bags with radioactive star stuff. A Hollywood spider man poses as "The Thinker" and contemplates his life while waiting for a bus. Massive Super Murals & Imaged Bus Stops with vital messages is, again, from a beautiful girl nicknamed "Bubblehead." She has a long history of creating massive street art, graffiti and wild postings with messages calling for the public to do the right thing on important issues that impact our lives. "RadioActive Bubblehead" just painted at Hollywood & Vine is overlooking the historic Pantages Theatre and the Hollywood Walk of Fame. "PLS DNT TXT + DRIVE", another Bubblehead SuperMural, along with many celebrities such as Oprah Winfrey's "No Phone Zone" and Justin Bieber, have helped send this important message in imploring all of us to not text and drive. This Mystery Girl a.k.a Bubblehead, created by artist Mike McNeilly, has been painted on the largest Manhattan wallscape on Park Avenue that raised awareness for organizations such as AMFAR, Project Angel Food and APLA. Her messages have been displayed on the Aircraft Carrier Intrepid in conjunction with the NYPD to give runaway kids a chance to call for help. On the Sunset Strip in Hollywood, her massive street art reaches out to "Stop the Violence…Save the Children"…from guns, bullies, child abuse, drugs, prostitution. She has also asked for support by the public for local organizations such as Hollygrove Orphanage, L.A.'s first orphanage and where Norma Jean Baker a.k.a Marilyn Monroe lived as a child, as well as Children of the Night, a private non profit organization dedicated to assisting children between the ages of 11 and 17 on the streets helping them with food to eat and a place to sleep. 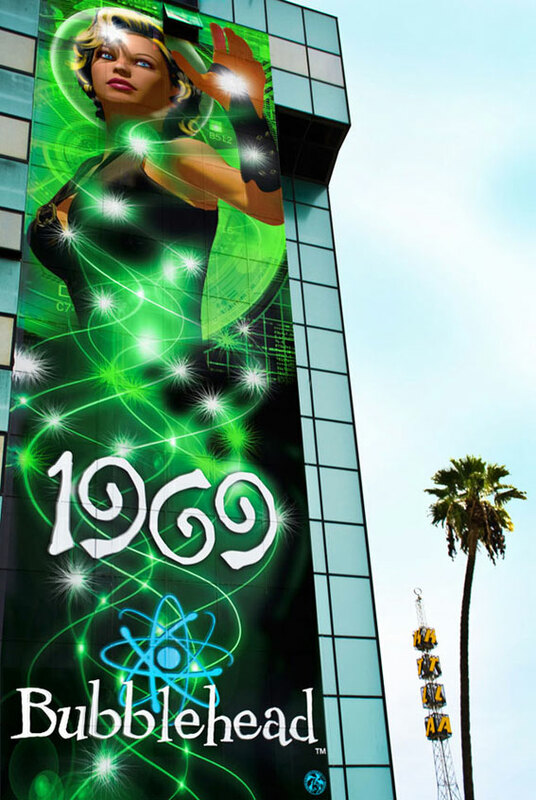 "Bubblehead 1969" imaged on the Metropolitan on the Sunset Strip in Hollywood, shows Bubblehead playing "OZ" as she travels in time. 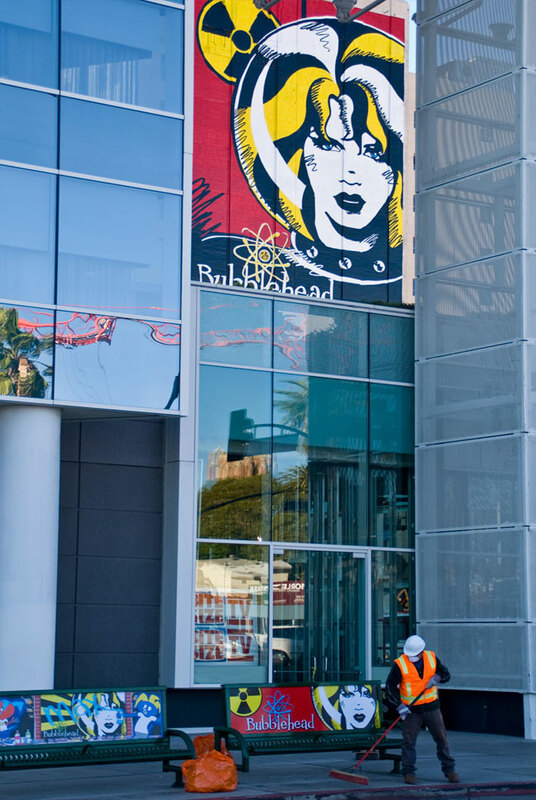 Just for the record, many of the massive street art murals of Bubblehead are aiming to celebrate life, love and liberty.